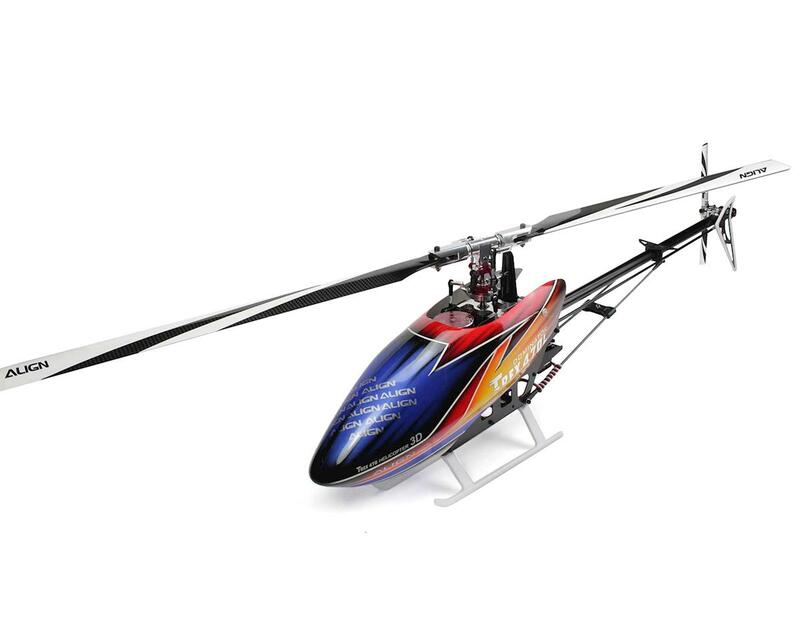 The T-Rex 470L Electric Helicopter is a freshly designed new size for Align, featuring 380mm main blades which have become ever more popular within the helicopter community. Included within the kit is an excellent electronics package which will provide proven and reliable performance at an excellent price to performance ratio. By moving to 380mm Main Blades, pilots will notice an improvement not only in performance for all aspects of flying, but additional stability due to large disk area in flight. Overall the larger helicopter will improve visibility over a standard 450 (325-360mm Main Blades) helicopter. By bumping up the power package to 6s 1800 and a matched 1800kV motor additional flight time can be added to the heli, or insane performance can be provided with higher headspeeds. The T-Rex 470L will be extremely versatile, and should be a staple in most pilots hangar. It can be flown in an average sized park for the sport flyer, or taken out to your local flying field to lay down excellent 3D performance. Overall, this is an excellent heli kit without breaking the bank. Larger than a 450 size heli but a tad smaller and cheaper to maintenance than a 500 size heli (but it flies like one!). The build process was straight forward and the manual was precise. My only complaint was that Align made several changes to the parts within the 1st month of this being released. Anyone with a newer kit will have these parts included but those who purchased the 1st batches were given the option to have the updated parts sent to them for free. I had a hard time getting Amain to send me the updated parts so i end up going to Align's US distributor for the parts. The stock electronics are pretty good but i end up swapped the ESC and FBL unit to my liking. so nice... solid clearances after shimming with bearing blocks unbolted, screw in after main shaft is tight. Good kit, hardware is absolute garbage. Literally every little cap screw has stripped. One of which cannot be removed as it holds the tail rotor servo arm on. Absolutely no idea how I’m going to try to remove it. Beastx system is appropriately named as it’s damned difficult to set up. Instructions are vague and a lot of it does not seem to apply. I thought I was saving some money going with Align and the pre setup kit. Ended up with a box of Chinese garbage. Buyer beware of bad main gear bearings. Mine had such a bad wobble that it would have probably flipped over on spin up. I even replaced the main gear thinking that was the problem but after 4 replacements it still wobbled horrifically. After weeks and weeks of waiting, sending videos and sending in the bearing for inspection to Align, I finally gave up and returned my kit that was 75% built. Align customer service was not very helpful and said the wobble was normal. Everyone one including expert pilots who saw the video said not to fly it. The wobble could have damaged the heli or caused serious bodily harm to myself or others. I suppose I could have bought a new bearing since Align seemed to be in denile of the defect but I didn't want to deal with their customer service if any other defects occurred with the build. 0 of 9 customers found this review helpful.